Nurse Anne Lee blames herself for a fatal mistake of her sister Lucy, who also is a nurse. Anne loses her job, and gets a new one at a poorly equipped country hospital. There she falls in love with Dr. Prescott, who is battling with Mr. Bowly, the chairman of the local hospital board, who also makes Anne’s life miserable. 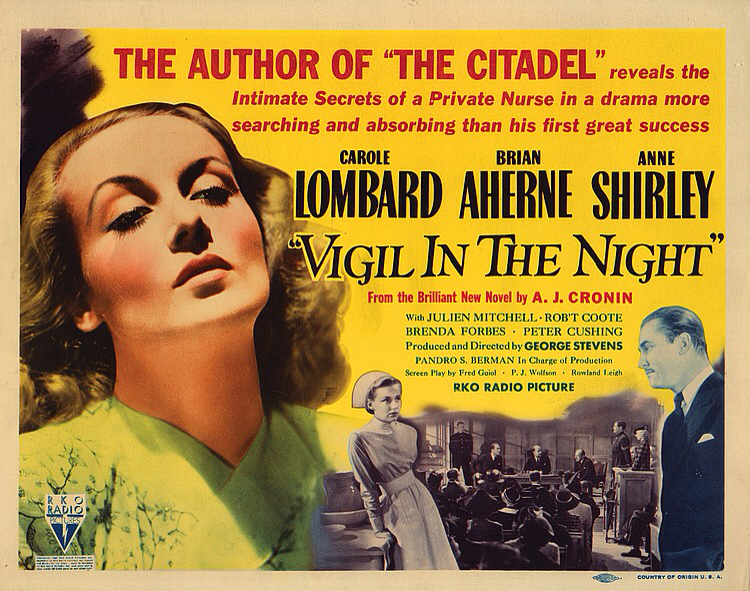 But then a virulent epidemic begins…Nurse Anne Lee is played beautifully by Carole Lombard but was held up several weeks when Carole Lombard was admitted to the hospital after suffering a miscarriage. The press dubbed it an ‘appendectomy’ to cover up. She would die tragically only 2 years later in a plane crash at only age 33. This film shows sparks of what she could have become if she continued acting, as she was already brilliant. My favorite Lombard movie would be her last, the incredibly To Be or Not To Be, although My Man Godfrey is fantastic too, also written by none other than…Morrie Ryskind. An escaped prisoner (Cary Grant) and a stuffy law professor (Ronald Colman) vie for the hand of a spirited schoolteacher (Jean Arthur). Stevens would say of Arthur, “One of the greatest comediennes the screen has ever seen. 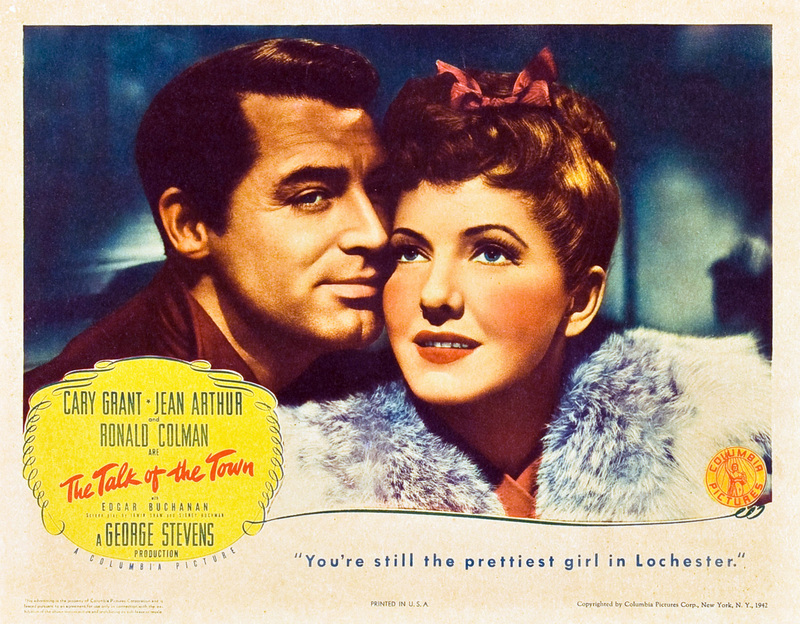 When she works, she gives everything that’s in her, and she studies her roles more than most of the actresses I’ve known.” The studio considered filming two different endings, with Jean Arthur pairing off with Cary Grant in one, and with Ronald Colman in the other, and letting the audience decide by voting in sneak previews which one they preferred. However, in the papers of director George Stevens, all the screenplay drafts contained the current ending. I won’t tell you who she ends up with. The misadventures of two social-climbing women in small town America. Katharine Hepburn always viewed Alice as one of her personal favorite roles. Katharine Hepburn credits director George Stevens for her change in the public’s perception, by helping her, in “Alice Adams”, portray more warmth and vulnerability than she had ever shown previously. The original script ending followed the ending of the novel, in which Alice grows up and gets a job – she does not get Arthur in the end. Katharine Hepburn and George Stevens both much preferred this ending, but the studio made Stevens film a happier ending in which Alice and Arthur end up together, which is seen in the final cut. I have to say, I’m so glad they did this, as I’m a romantic at heart and love the ending as it stands. A professor (James Stewart) marries a nightclub singer (Ginger Rogers), much to the consternation of his family and friends back home. 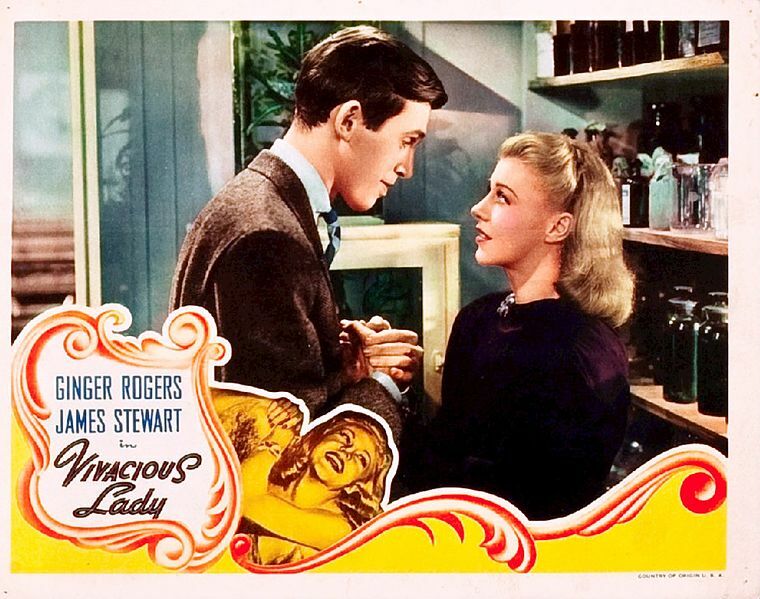 Ginger Rogers recommended Jimmy Stewart for this film, even though they had not worked on a film together previously. The two were dating at the time, and with Rogers being one of RKO’s biggest stars, she got her way. Rogers worked with Stevens previously, two years earlier on Swing Time (1936). Lady Alyce Marshmorton (Joan Fontaine) must marry soon, and the staff of Tottney Castle have laid bets on who she’ll choose, with young Albert wagering on “Mr. 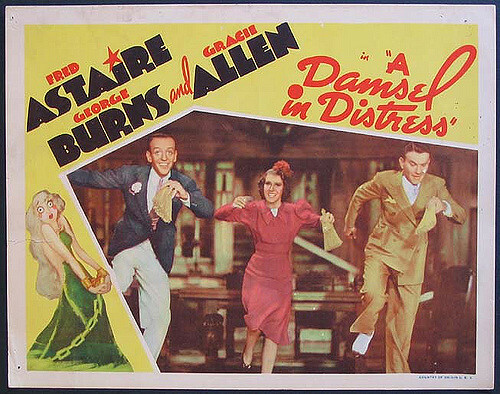 X.” After Alyce goes to London to meet a beau (bumping into dancer Jerry Halliday – Fred Astaire – instead), she is restricted to the castle to curb her scandalous behavior. Albert then summons Jerry to Alyce’s aid in order to “protect his investment.” This movie is especially good because of the co-stars, George Burns and Gracie Allen! After learning that Fred Astaire wanted Burns and Allen to audition for him, George Burns hired a vaudeville dancer he knew to choreograph a complex routine with whisk brooms. Astaire enjoyed the performance by George and Gracie so much that he insisted on working it into the film! Director George Stevens shot The Greatest Story Ever Told in the American Southwest, in Arizona, California, Nevada and Utah. Pyramid Lake in Nevada represented the Sea of Galilee, Lake Moab in Utah was used to film the Sermon on the Mount, and California’s Death Valley was the setting of Jesus’ 40-day journey into the wilderness. Stevens explained his decision to use the United States rather than in the Middle East or Europe in 1962. “I wanted to get an effect of grandeur as a background to Christ, and none of the Holy Land areas shape up with the excitement of the American Southwest,” he said. “I know that Colorado is not the Jordan, nor is Southern Utah Palestine. But our intention is to romanticize the area and it can be done better here.” Forty-seven sets were constructed, on location and in Hollywood studios, to accommodate Stevens’ vision. 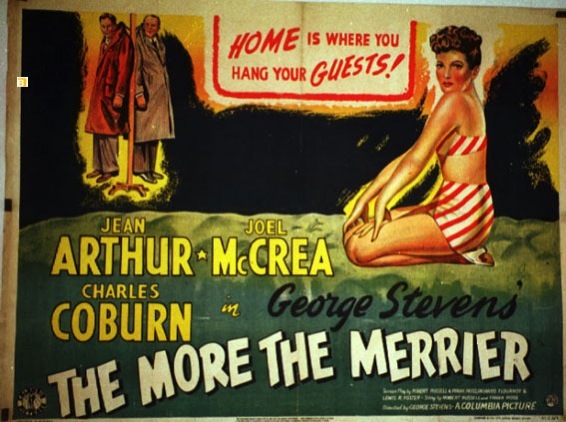 During the World War II housing shortage in Washington, two men (Charles Coburn and Joel McCrae) and a woman (Jean Arthur) share a single apartment and the older man plays Cupid to the other two. Jean Arthur was getting into trouble with Columbia Pictures because she kept turning down roles. Rather embarrassed about this, she contacted her friend Garson Kanin and asked him to pen her something that she could take to the studio. Kanin was out of work at the time and readily accepted her proposal which Arthur ended up paying for out of her own pocket. Joel McCrea didn’t originally think he was right for the part of Joe and thought Cary Grant would have been better suited. Ironically, Grant would appear in the remake, Walk Don’t Run (1966), albeit in the Charles Coburn role. This was George Stevens’ last picture for Columbia before he joined the Army as chief of the combat photographic unit, where he shot several films for the US war effort. I’ve written about this film before. I love the story about the three soldiers but am not thrilled that they cast a middle-aged white guy in the kid’s role, Gunga Din. In 19th century India, three British soldiers and a native waterbearer must stop a secret mass revival of the murderous Thuggee cult before it can rampage across the land. Sabu was first choice to play Gunga Din, he would have been great; when it became clear he was unavailable, Sam Jaffe was hired in his place. At the time he was playing water-boy Gunga Din, Sam Jaffe was 47 years old. In an interview years later, Jaffe (a Jewish Russian-American) was asked how he was able to play an Indian Muslim. Jaffe replied he kept telling himself to “Think Sabu.” Other than this, it is a great film. 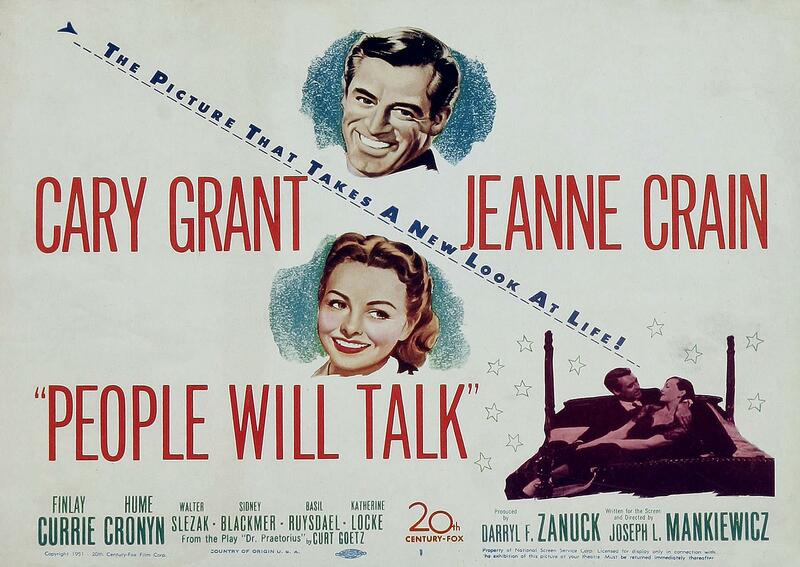 And it was very popular, it was second only to Gone with the Wind (1939) as the biggest money-maker of 1939. Harrowing story of a young Jewish girl who, with her family and their friends, is forced into hiding in an attic in Nazi-occupied Amsterdam. 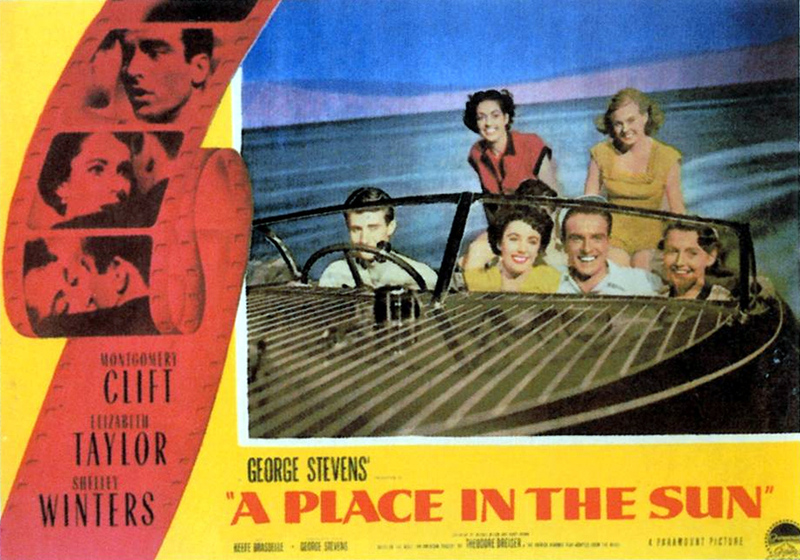 The second of three George Stevens films in which Shelley Winters starred. The others are A Place in the Sun and The Greatest Story Ever Told. She received Oscar nominations for both A Place in the Sun and The Diary of Anne Frank, winning the Academy Award for Best Supporting Actress for the latter. 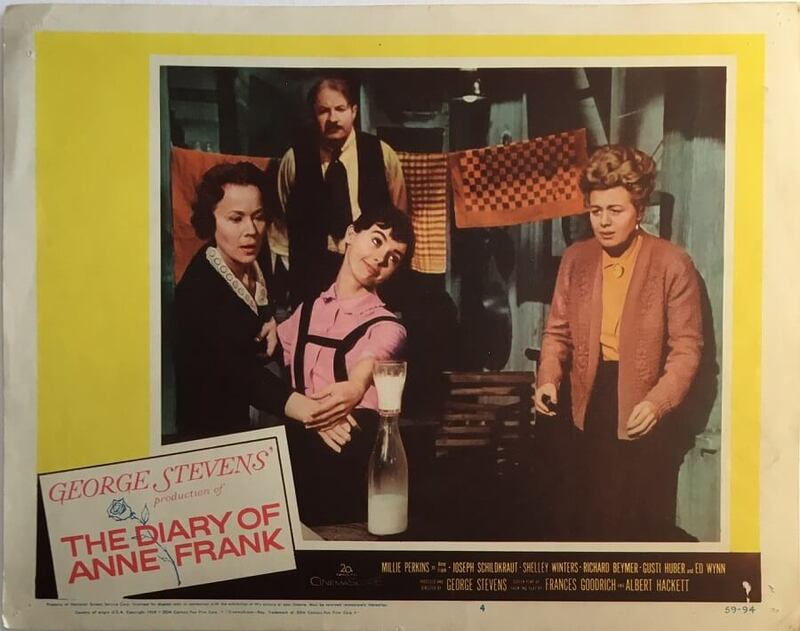 Shelley Winters donated the Best Supporting Actress Academy Award she won for the role of Mrs. Van Daan to the Anne Frank Museum in Amsterdam, after promising Otto Frank that she would do so if she were to win the award. It remains on permanent display in the museum to this day. My favorite Fred and Ginger movie! A performer and gambler travels to New York City to raise the $25,000 he needs to marry his fiancée, only to become entangled with a beautiful aspiring dancer. Ginger Rogers would go on to say, “I adore the man. I always have adored him. It was the most fortunate thing that ever happened to me, being teamed with Fred: he was everything a little starry-eyed girl from a small town ever dreamed of.” Then, when asked about Ginger, Fred would return the compliment, “Excuse me, I must say Ginger was certainly the one. You know the most effective partner I ever had. Everyone knows. That was a whole other thing what we did…I just want to pay a tribute to Ginger because we did so many pictures together and believe me it was a value to have that girl…she had it. She was just great!”. 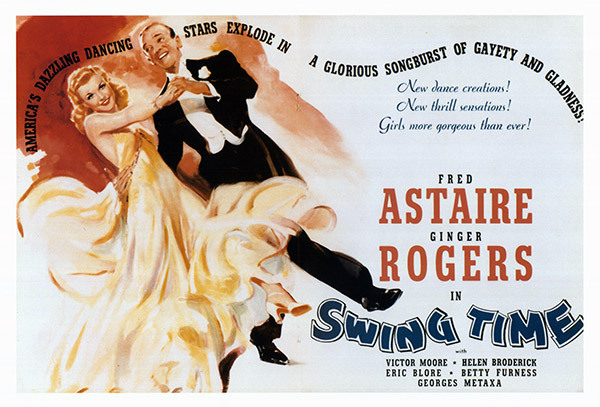 This was Ginger Rogers’ favorite of her films with Fred Astaire. Arguably, the best of James Dean’s 3 films. 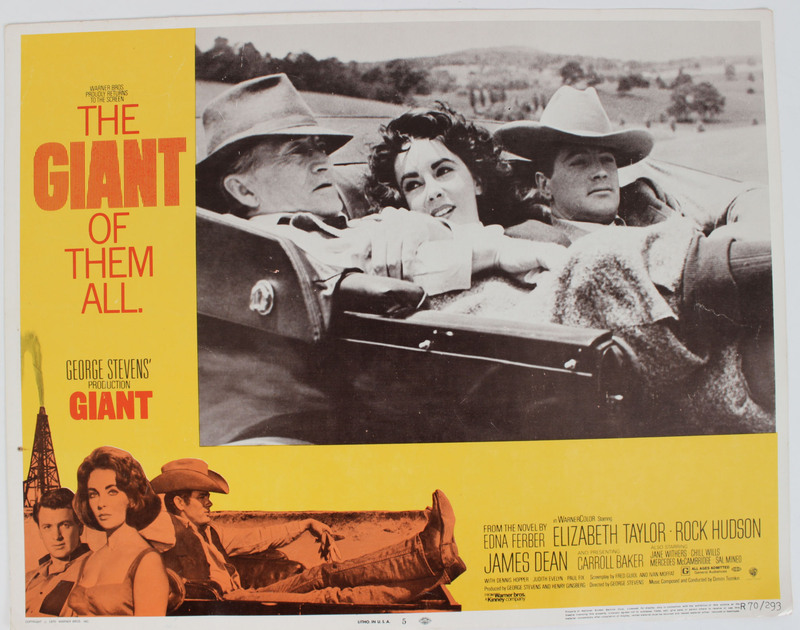 Sprawling epic covering the life of a Texas cattle rancher (Rock Hudson) and his family and associates. When Rock Hudson was cast, director George Stevens asked him whom he preferred as his leading lady, Grace Kelly or Elizabeth Taylor. Hudson picked Taylor, who was cast and ended up becoming lifelong friends with Hudson. James Dean called the shooting style of director George Stevens the “around the clock” method, because Stevens would film a scene from as many different angles as possible, which made everything seem to take longer to do. James Dean finished principal photography on Friday September 23, 1955. He died in a car crash a week later. What a great movie, rival reporters Sam (Spencer Tracy) and Tess (Katherine Hepburn) fall in love and get married, only to find their relationship strained when Sam comes to resent Tess’ hectic lifestyle. 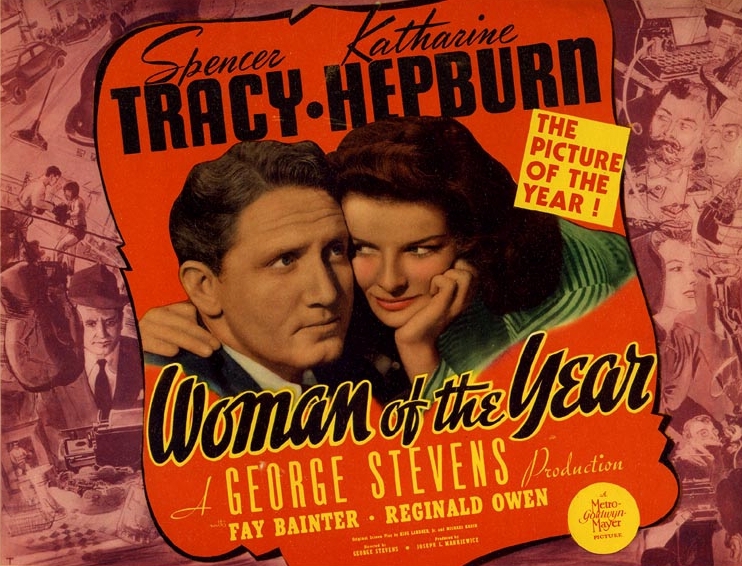 As Katharine Hepburn’s close friend and frequent director, George Cukor was a natural choice to direct, but for her first film with Spencer Tracy, Hepburn wanted Tracy to be as comfortable as possible, so as a quasi-producer, she hired George Stevens, who had directed her in Alice Adams. As Hepburn said, “I just thought he (Tracy) should have a big, manly man on his team – someone who could talk about baseball.” Cukor (who was openly gay and known for his friendships with actresses) would later become a good friend of Tracy and would direct both actors in Keeper of the Flame (1942), Adam’s Rib (1949) and Pat and Mike (1952). 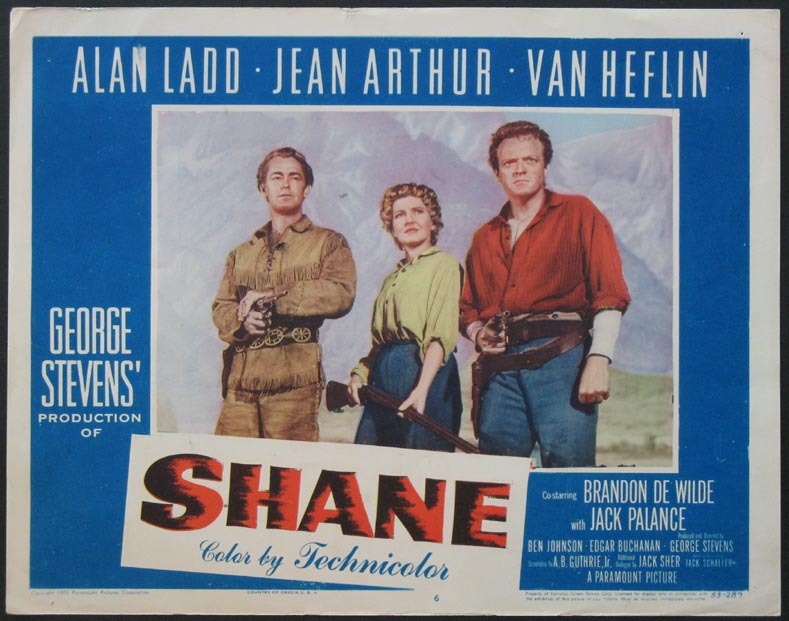 A weary gunfighter (Alan Ladd) attempts to settle down with a homestead family, but a smoldering settler/rancher conflict forces him to act. This film is always in the top ten of any list about the best westerns ever filmed. Ranked #3 on the American Film Institute’s list of the 10 greatest films in the genre “Western” in June 2008. Jean Arthur, then aged 50, came out of semi-retirement to play Marian Starrett, largely as a favor to her friend, director George Stevens. She would retire completely from the film business after this picture. 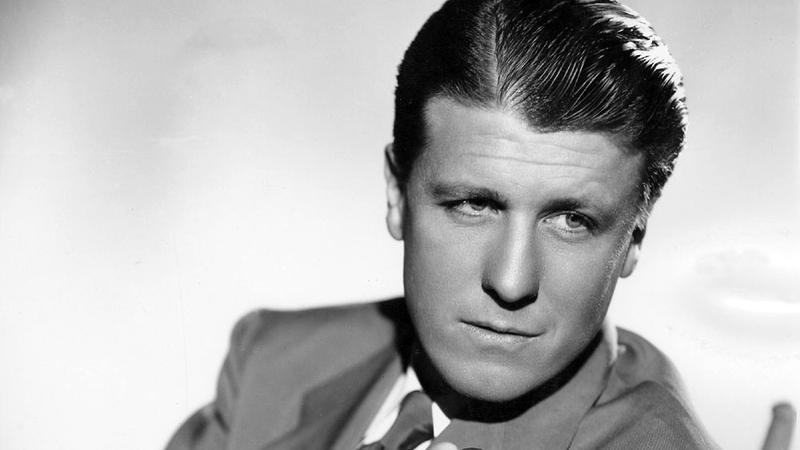 Having witnessed during his WW2 service the profound effects a bullet could have on a man, realism was important to George Stevens during the making of the film. This therefore is one of the first movies to use stunt wires to pull the actors or stuntmen backwards to simulate when they’ve been shot. George Stevens referred to this film as being his war movie. You’ll be surprised at what I rank as the top Cary Grant movie! Let’s get that out of the way, right up front. You should also know that he’s my favorite actor, so I love most of his movies. It’s really hard to come up with his best, so I’ll for-go that and only pick my favorites of all of his films. I also may have nostalgic reasons behind some of my picks, but as time goes by, those types of things really play into our favorites don’t they? Like who we watched it with, what was going on in our lives when we saw it, how did it make us feel, and so on and so on. There are really two storylines here, the first one is based on Rudyard Kipling’s short stories of The Soldiers Three and is the reason why the movie made my list. The second storyline is based on Rudyard Kipling’s poem Gunga Din and is the reason this movie almost didn’t make my list. The poem is about a boy and would have made for a great movie, if the role was not played by a 47-YEAR OLD WHITE MAN (Sam Jaffe). The two storylines mingle pretty well overall, it’s just really annoying to see this old man playing a boy. Of course you can thank Sleepless in Seattle for an awareness to this movie to my generation in the 80’s…but it’s such a great movie, it was bound to have a resurgence. 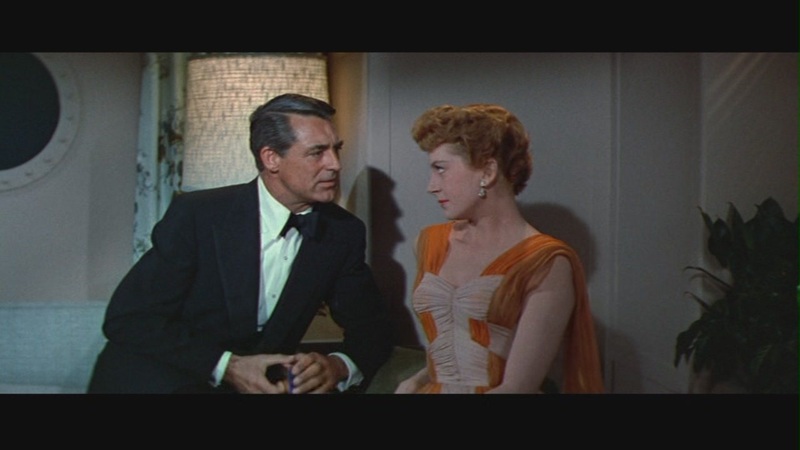 This is a remake of Love Affair, both directed by Leo McCarey, and is superior to the first film in a lot of ways, but in part due to the fact that Cary Grant and Deborah Kerr was given the freedom of improvisation during filming and many of the new lines made it into the final cut. Cary Grant was a brilliant improviser. 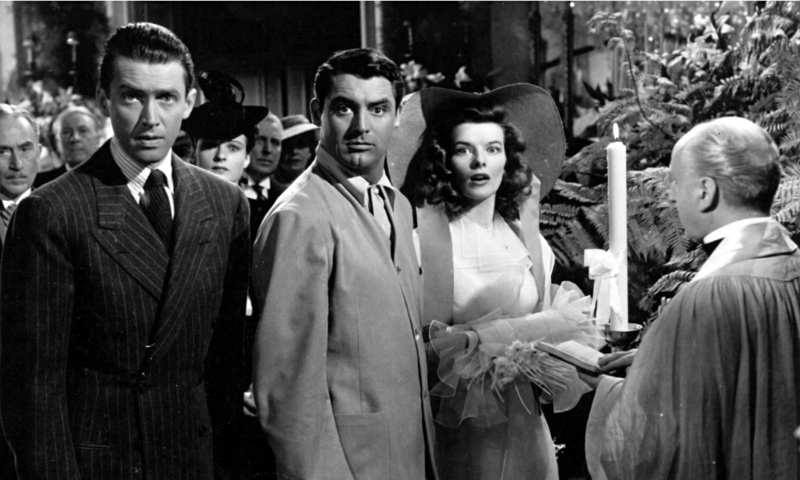 At about this time, I realized that Katherine Hepburn had actually several successful on-screen pairings with other actors, other than Spencer Tracy, and one of these was with Cary Grant. They are magnificent together and would go on to appear in four movies together. One of the things I remember about this movie is the flip that Cary Grant does at the end of the movie. It was one of the only times that his background as an acrobat is ever seen on-screen in his movies. 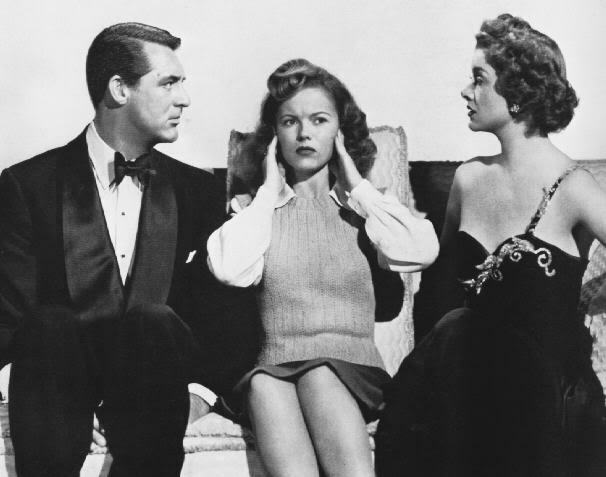 This list could also be a celebration of the writer Donald Ogden Stewart, as 3 of his movies make this list as he wrote Love Affair, Holiday and The Philadelphia Story. I won’t talk a lot about this film, as I enjoyed it, when I first saw it. It’s tainted a bit over time when I learned about all the cheating that was going on behind the scenes. You can read up on that somewhere else. It’s ironic, really, when you think of all the fantastic family films that the director Melville Shavelson is famous for. 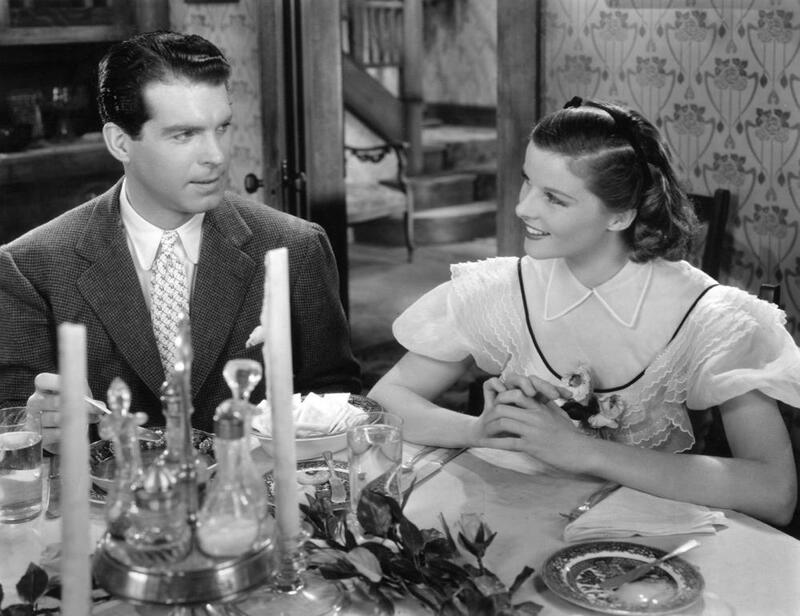 Films like Yours, Mine and Ours, Room For One More (also starring Cary Grant and then wife, Betsy Drake, but doesn’t make my list), Trouble Along the Way (which I mention in a previous blog post), The Seven Little Foys, and The Five Pennies. Great movie directed by Blake Edwards and also starring Tony Curtis! Some of the plot points of the movie are based on real incidents in WWII. The original actor chosen to play the role Cary Grant took was Bob Hope, but he turned it down and later really regretted it. This is just a really fun movie directed by Garson Kanin and co-starring Irene Dunne and Randolph Scott. Randolph Scott and Cary Grant were roommates for 12 years when they first arrived in Hollywood. This is their first and only movie together. 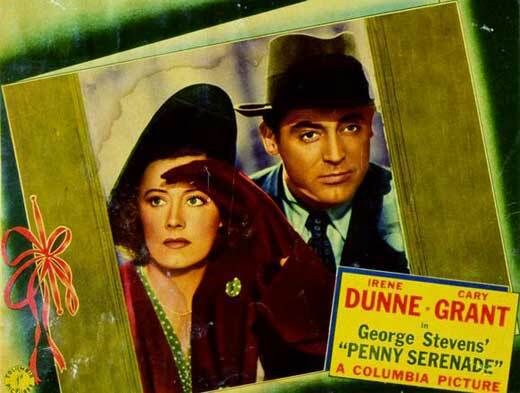 Irene Dunne acted in 3 movies with Cary. They are a great pair and I could have easily added their other two movies to this list but one movie is really sad and the subject matter of the other is just not one of my preferences, but both movies were very good. 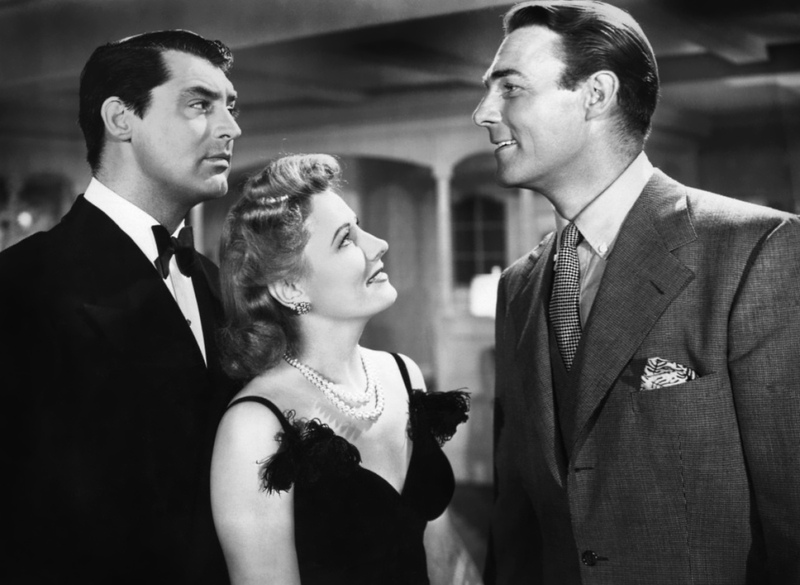 Penny Serenade and The Awful Truth. My Favorite Wife was remade in 1963 as Move Over, Darling with Doris Day and James Garner. I really like that version as well. This is Cary’s second to last film and by all accounts his character is supposedly the closest to his real personality. He later said that he enjoyed making this movie as he got to be the “Father” to a group of young girls and it made him realize that he missed out on fatherhood. He and wife Diane Cannon would have his own daughter just 2 years later, Jennifer Grant. he would stay in touch with many of the girls over the years as they grew up and had families of their own. He was an incredibly devoted father and retired soon after Jennifer was born so that he could spend his remaining years with her. He would go on to say that she was his “best” production. My mother introduced this one to me one afternoon when I came to visit her and we spent the day just laughing all the way through it. Especially when Ann Sheridan makes Cary Grant climb a pole to read a sign at the top of it just to realize that the sign says, “Wet Paint”. Directed by Howard Hawks, this film was pretty popular when it came out, but virtually forgotten over time. 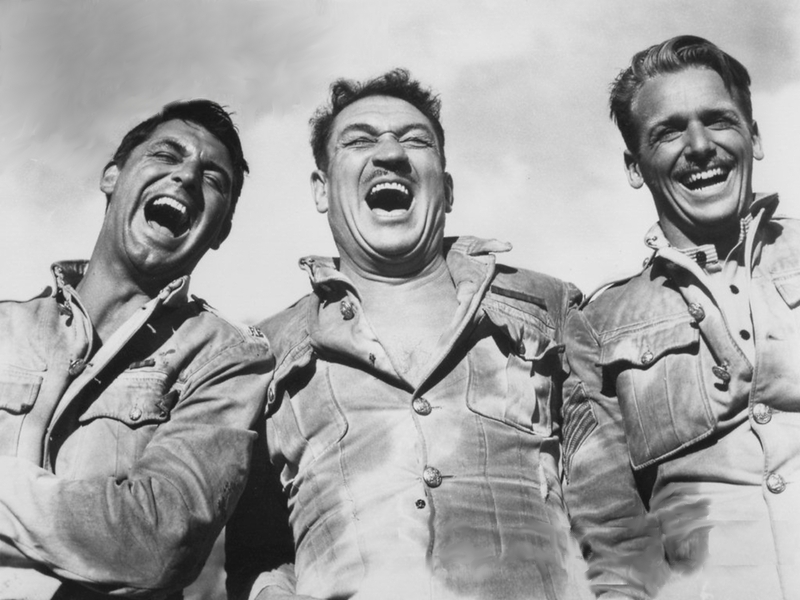 The film grossed over $4.5 million, making it 20th Century Fox’s biggest earner of 1949. 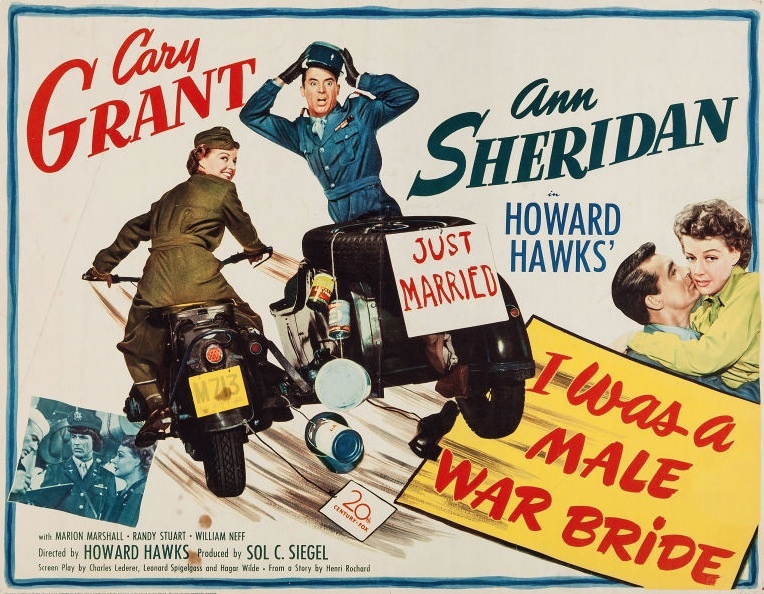 The film was also Howard Hawks’ 3rd highest grosser, behind only Sergeant York (1941) and Red River (1948). One of two directed by Alfred Hitchcock that made my list. I love it when Cary’s improvisations make reference to his past, as one does in this film. Cary’s role of John Robie, mentions that as a youth he was in a trapeze group that traveled around Europe. In real life, Cary was in an acrobatic troupe that toured around Europe (and eventually came to America) when he was young. 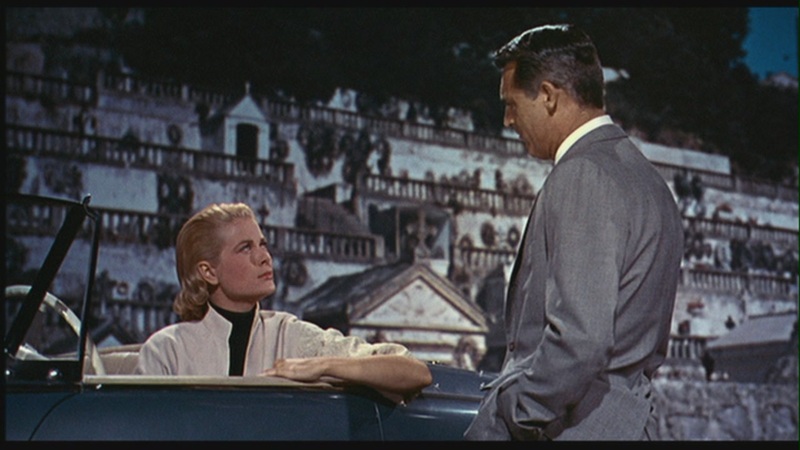 This movie also features Grace Kelly in the on-screen’s only pairing, but they have incredible chemistry. This movie is so fun, in part to a just-about-grown-up Shirley Temple (who’s fabulous as usual) but more so because of the fantastic Myrna Loy, who has become a favorite actress of mine over the years. Directed by Irving Reis and written by Sydney Sheldon (creator of TV’s The Patty Duke Show, I Dream of Jeannie and Hart To Hart), it’s a great little film that has really gone unnoticed as of the last couple of decades. The top 5 will make sense to most except my number 1 choice is sure to be confusing to most. But this one would make just about everyone’s top 5. You’d be hard pressed to find a better thriller than this one. 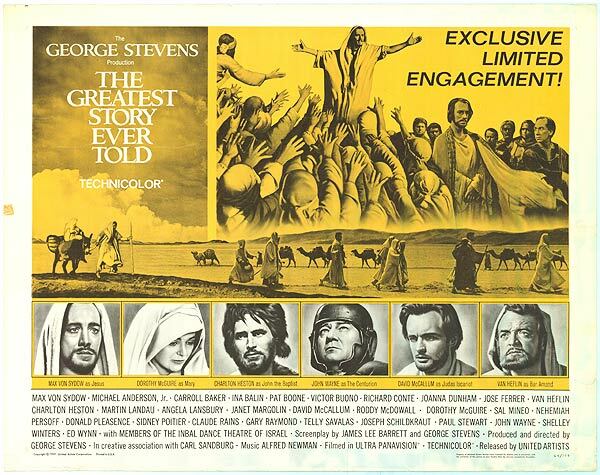 Great supporting cast with Eva Marie Saint, James Mason and Martin Landau. 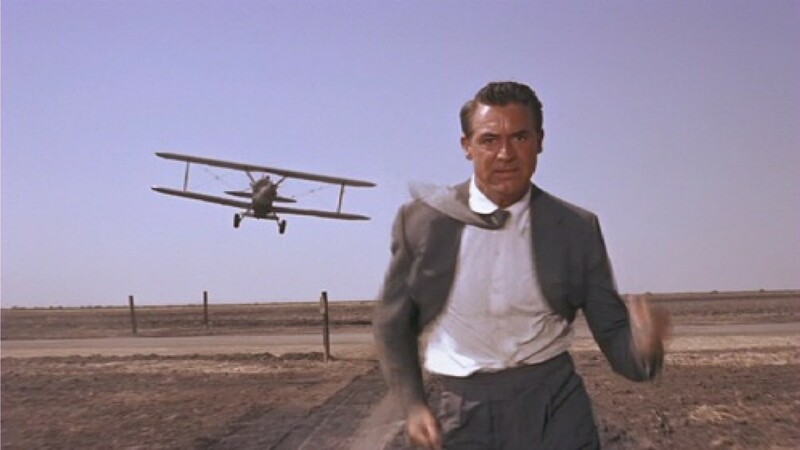 Cary Grant found the screenplay baffling, and midway through filming told Alfred Hitchcock, “It’s a terrible script. We’ve already done a third of the picture and I still can’t make head or tail of it!” Hitchcock knew this confusion would only help the film-after all, Grant’s character had no idea what was going on, either. Grant thought the film would be a flop right up until its premiere, where it was rapturously received. As a side note, a panel of fashion experts convened by GQ in 2006 said the gray suit worn by Cary Grant throughout almost the entire film was the best suit in film history, and the most influential on men’s style, stating that it has since been copied for Tom Cruise’s character in Collateral (2004) and Ben Affleck’s character in Paycheck (2003). This sentiment has been echoed by writer Todd McEwen, who called it “gorgeous,” and wrote a short story “Cary Grant’s Suit” which recounts the film’s plot from the viewpoint of the suit. Now the placement of these final four was pretty hard for me as I really LOVE all of these films. They are all perfect to me. Perfect stories, perfectly cast, perfectly directed by Stanley Donen. 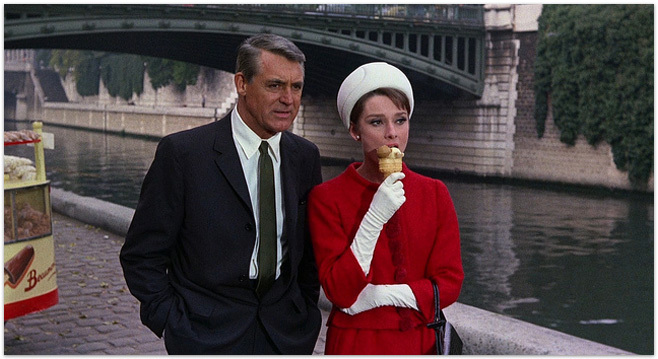 Charade is a great movie and has some of the best actors around. Audrey Hepburn, George Kennedy, Walter Matthau and James Coburn. The chemistry between Audrey and Cary is so great, they had a wonderful time on location and ad-libbed several classic exchanges. My favorite being, “How do you shave in here…”, Audrey says while pointing to Cary’s chin. After finishing this film, Cary Grant was quoted as saying, “All I want for Christmas is to make another movie with Audrey Hepburn,” and this nearly happened twice when Cary and Audrey almost made My Fair Lady and Father Goose together. The character played by Cary even quotes a line from My Fair Lady (“On the street where you live”), the film version of which would star Audrey the following year. I mentioned this one earlier as a screenplay written by Donald Ogden Stewart. It also stars Katherine Hepburn and James Stewart. My only wish is that they had given the role played by John Howard to Clark Gable instead, that would have been really fantastic. As it is, he’s largely forgettable in the role as Katherine Hepburn’s fiancee. 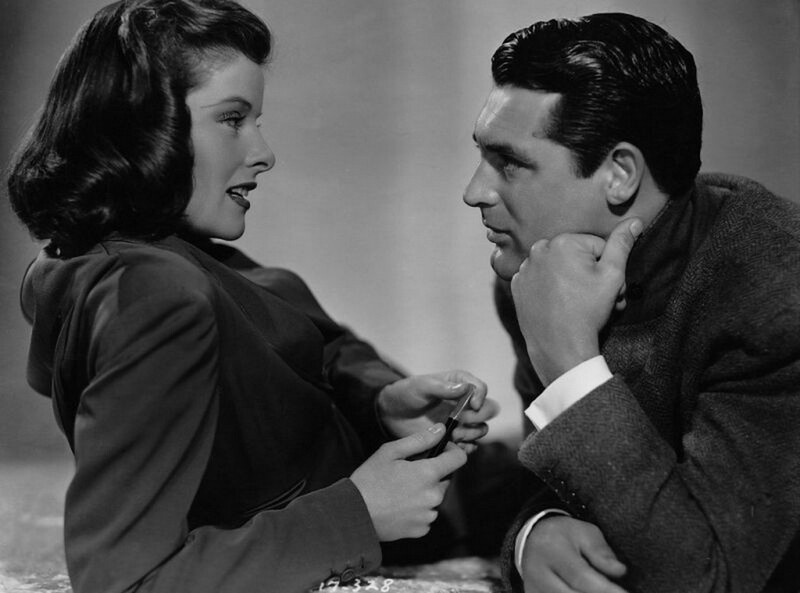 In response to Cary Grant’s improvisational skills, James Stewart once said in an interview, “I play a writer who falls in love with Katharine Hepburn. The night before her wedding I have a little too much to drink. This gives me the courage to go and talk to Cary, who’s playing her ex-husband. So I go to Cary’s house and knock on the door. It’s obvious I’ve had too much to drink, but he lets me in. It was time to do the scene, and Cary said, “George, why don’t we just go ahead? If you don’t like it, we’ll do it again.” So, without a rehearsal or anything, we started the scene. As I was talking, it hit me that I’d had too much to drink. So, as I explained things to Cary, I hiccuped. In answer to the hiccup, Cary said — out of the clear blue sky — “Excuse me.” Well, I sort of said, “Ummm?” It was very difficult for me to keep a straight face, because his ad-libbed response had been so beautifully done … Cary had an almost perfect humor.” Just watch it for yourself, it’s a perfect moment on film. Now Stewart was being modest, by the way, he’s great in the film and would go on to win the Academy Award for his role. 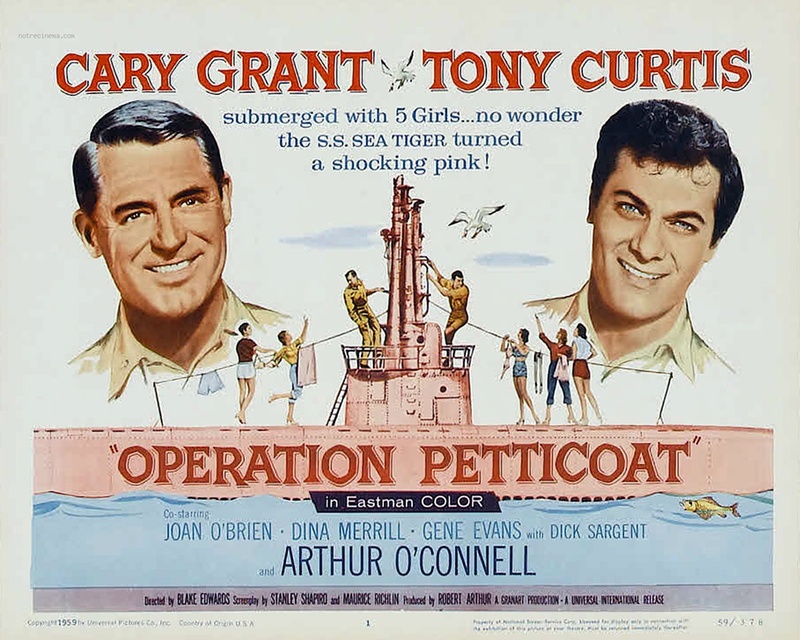 Something Cary Grant never did, which to me is the biggest sham over the years, maybe not for this film, but for any number of his other performances. Donald Ogden Stewart won an Academy Award as well for his wonderful script. 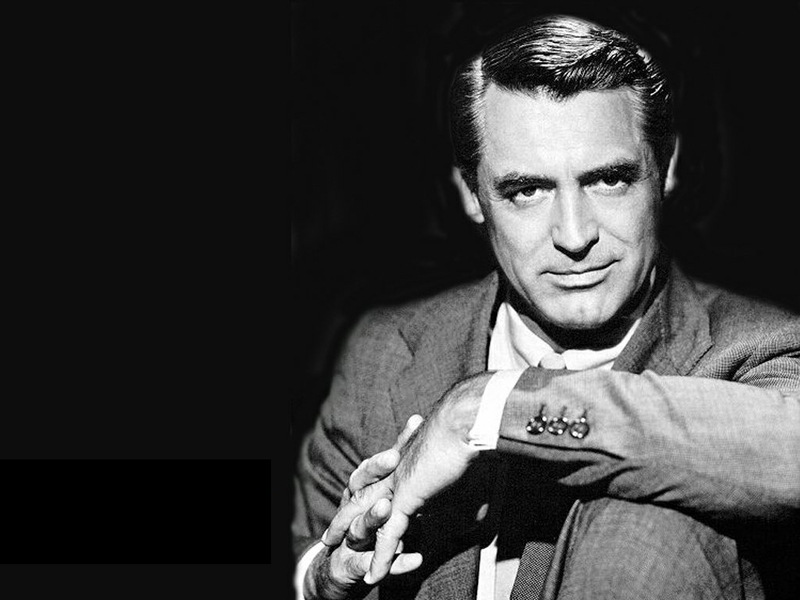 Cary Grant was given the choice of which of the two male lead roles he wanted to play. Surprisingly, he chose the less showy part. I mention this film in detail in the blog post for The Front Page. It’s was a film directed masterfully by Howard Hawks. He switched what was originally 2 males in the play to a male and female and divorced at that for the movie and called it, His Girl Friday. It was stroke of pure genius. 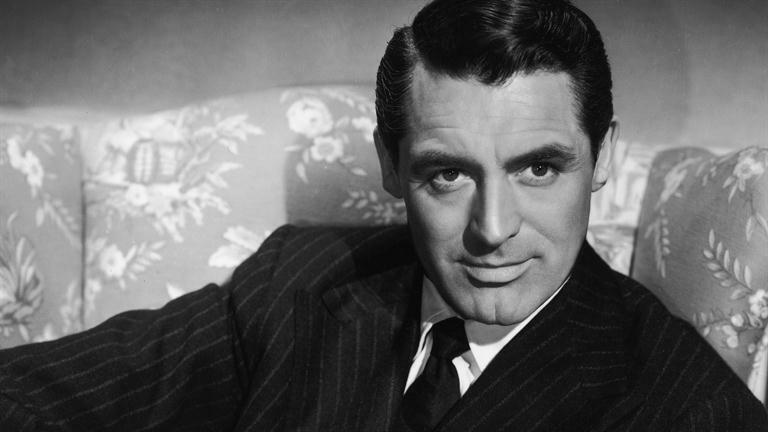 1940 was the ultimate year for Cary Grant as he made 4 movies released that year and 3 of them make my top 15 list. My Favorite Wife and The Philadelphia Story being the other 2 and the one not in the list being The Howards of Virginia. The dialogue in this film is extremely fast, with most characters talking over each other. It is estimated that the normal rate of verbal dialogue in most films is around 90 words a minute. 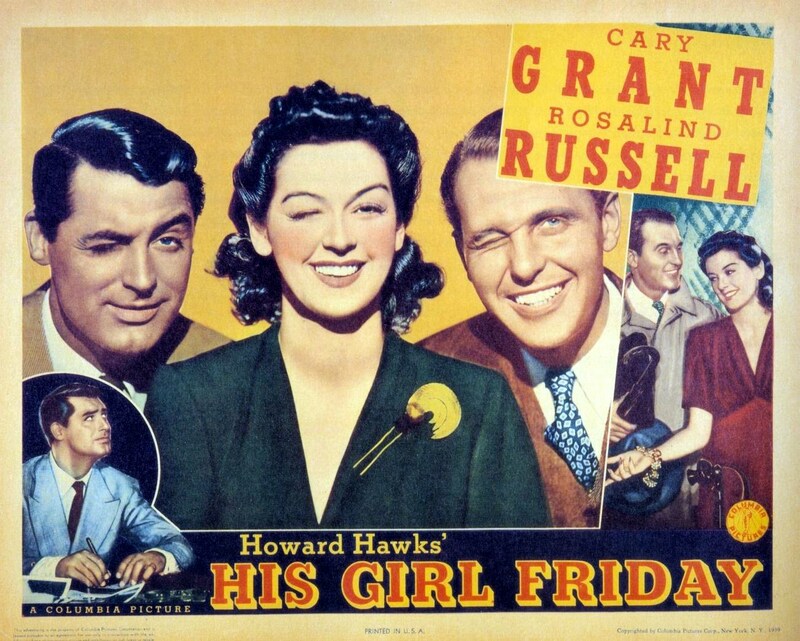 In His Girl Friday, the delivery has been clocked at 240 words a minute. Even so, there is still a lot of improvisation going on, and it’s a lot of fun. 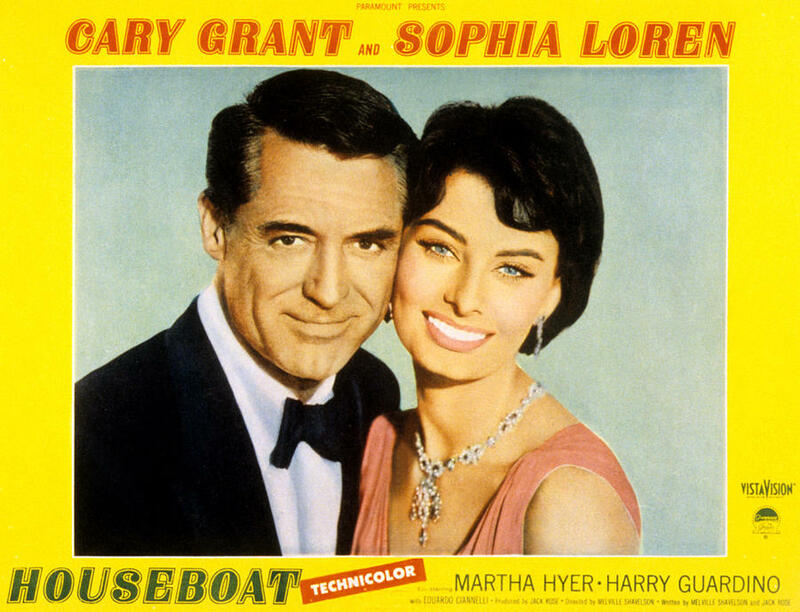 I have this lobby card in my home office, my wife gave it to me for Christmas one year, knowing it was my favorite film of all time, let alone, my favorite Cary Grant movie. Joseph Mankiewicz wrote and directed this film from a play (Dr. med. Hiob Prätorius) by Curt Goetz. Great cast includes Hume Cronyn, Jeanne Crain, Finlay Currie, and Walter Slezak. This film never ceases to make me laugh and cry, it’s full of humor, suspense and drama. It also doesn’t shy away from some of the biggest social commentary that I’ve ever seen in any movie. Dr. Praetorius as played by Cary Grant simply represents a better man that many of us rarely ever achieve. His motives pure, his intellect, compassion, wit and his viewpoint strong and true. In truth, I haven’t seen a film that was more thought-provoking than this one. It’s introspective and makes you examine the human spirit, social mores, science, etiquette and prejudice of community and medicine in such broad and entertaining ways. Maybe I’m looking into this way too much, but it sure is damn entertaining! I guess I like this film so much because at heart I am an emotional animal and this film is at it’s core, emotional. The plot may be muddled for some and it’s identity lost as some people can never define if it’s a comedy, drama, romance, detective story or what, but to me it’s all of those things and more. Well, there you have it. Now you may want to go back and watch all of these, or I hope, re-watch most of these, but the most important thing is that you enjoy his body of work. You may end up with a list like mine or you can go back to the drawing board and include his other films like, Notorious, Suspicion, Arsenic and Old Lace, Night and Day, Bringing Up Baby, Topper, Once Upon a Honeymoon, Mr. Blandings Builds His Dream House, Indiscreet, That Touch of Mink or any other of his fantastic films. But that’s the fun…finding your own top 15!